If you run a WordPress website which allows member logins such as a forum or BuddyPress site, membership site and so on, then you will probably want to customize the WordPress login system in some way or maybe even hide the fact that the site runs on WordPress. The default WordPress login is fine and functional for single person blogs but you may wish to customize it for clients to further their branding, you may wish to provide extra functionality such as authentication to stop spammers and hackers or you may want to allow people to login using social networks like Twitter, Facebook, Amazon or Google. Whatever your need for customizing the WordPress login system, there are a huge number of plugins available to you to use. Take a look through today’s post where we have collected together many different free and premium plugins to achieve what you need. TailoredLogin allows you to easily create a customized WordPress login page. Use the built-in Style Manager to upload a background image or header graphic, style the login form and even add widgets to your login page by dropping available widgets into the TailoredLogin widget areas. This plugin offers Style WP Login Page, Add Login, Register, Forgotten Forms To a Page, Front End Profile, Modal Login and Register Forms. With the fantastic release of WordPress 3.8 we now fid ourselves with the a new feature, never “officially” seen before in the WordPress admin; and this feature is having the ability to customise our dashboard with a selected colour scheme. Well that’s absolutely brilliant. There are a total of 11 sections you can setup for your template theme with over 46 individual options for login page. You can change the background and color of the entire login page, change the default WordPress Logo and it will automatically replace the link to www.wordpress.org. You can set a background image and color to the entire box. WP e-Commerce Social Login extension allows users to login and checkout with social networks such as Facebook, Twitter, Google, Yahoo, LinkedIn, Foursquare, Windows Live. A great plugin that permits the website admin to protect login & register forms with captcha, automatically ban IPs that brute-force attacks your website, detailed log of all login-related activities and redirect users based on roles and usernames. Socail Auth is a WordPress plugin/widget that lets you authorize your sign-in with social newtorks like Facebook, Twitter, Linkedin, Google, Yahoo. You can make a login area on your website in order to do let your users to authorize their sign-in with social networks by purchasing and integrate to your website.No need regisration anymore! WP Nice Screen Login is the final solution to customize the “Wordpress Admin Login Page”. You can choose from 5 default themes to redesign the Login Page, and bring to your clients a new professional page to login. The Login With Amazon for WooCommerce WordPress Plugin allows your users to log-in to your WooCommerce driven webshop using their Amazon credentials. Nearly everyone today has an Amazon account. Why not using this possibility of an easy-login without remember another password? It simply displays a Login With Amazon Button right beside your WooCommerce-Login page and/or on WordPress Login screen. WordPress Login Theme is a login style plugin. This plugin will adds an awesome login screen in your wordpress login. You can select login theme style & others color customization by using the options of this plugin. UserPro allow you to create unlimited custom profile fields easily and customize your profiles & registration form, you can create multiple registration forms and give each register form an automatic assigned user role (subscriber, customer, manager, etc.) control which fields are required for registering, which fields users can edit, which fields are private, and more! Realtime Visitor Tracking and Analytics. Options to Customize your WP sites most important sections & increase Security. Login protection, Customization of Login page / Registration page / Admin bar / Nav menu / Email address, Changing Usernames / DB prefix / WP_DEBUG mode, Email notification on login fails & Theme-Plugin Changes and a lot more options to customize you site. Analytics and Visitor tracking is an awesome feature to understand how traffic are coming to your site, what are they viewing. Also, Their Operating System, Browser and Screensize information gives you an idea how people are viewing your site, so you can decide whether your site needs an optimization or not. Social Login for WordPress is a plugin or extension for a WordPress which let user to login using their favorite social account . A number of color options are available for the login page of your website. Facebook survivor is an essential plugin for any wordpress based websites because it is replacing the old registration way with only one facebook button! Creates an easy to use login form that will display a pop-up window (modal window) for easy login, user registration or reset a password all from the front-end of any website. This is easily managed using a custom widget, shortcode generator or you can use PHP to insert this plugin into any custom area of your theme. This is a facebook login plugin as widget. This widget also supports default wordpress user login. A facebook application API needs to be created to setup this plugin. The setup is simple. Advance Login Style can fully customize your WordPress Login, Register page. The way your site is presented to your users is important. That is why we made the “Custom Login and Registration” plugin. It is designed so that both you and your users never see the built-in WP login, registration, and password reset forms. It is still compatible with all of WordPress’ built-in functionality and logout links will still function as they should. A login form widget is included to make it easy for your non-logged in visitors to find the login form. You are even able to add content to the login, registration, forgot password and password reset pages through the settings page. Each form has pre-set styling options and uses AJAX. From the settings you can choose either; stacked (default) or wide styling. Additional styling you can be achieved by adding your custom CSS or using one of the available hooks. Feel free to contact us and will add any additional hooks you need. The forms use AJAX to verify that the username and email are valid and are not already in use. Customize completely your WordPress Login Screen and Dashboard easily. Add your company logo to login screen, change background images, colors, styles etc. Customize your Dashboard footer text also for complete branding. Social Login is a professionally developed and free WordPress (BuddyPress compatible) plugin that allows your visitors to comment, login and register with 25+ Social Networks like for example Facebook, Twitter, Google, LinkedIn, PayPal, LiveJournal, Instagram, Вконтакте and Yahoo. 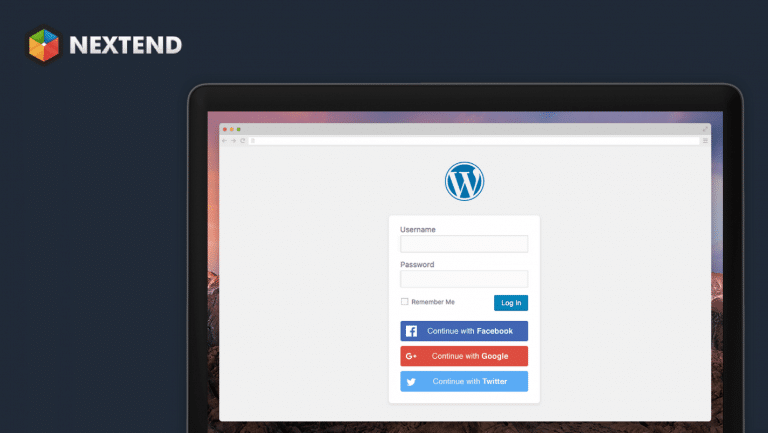 SimpleModal Login provides a modal Ajax login, registration and password reset feature for WordPress and utilizes jQuery and the SimpleModal jQuery plugin. Use this plugin to customize your login screen, great for client sites! Customize the logo on the WP login screen by simply dropping a file named login-logo.png into your WP content directory. CSS is automatic! This plugin helps change your Website’s login page logo, background & to add a message option in your WP Admin page. Webriti Custom Login plugin allows you to customize the default login page. With this plugin you can add a custom logo and customize the back ground color. It is ideal for Web Developers you would like to put their brands in front of the client. Allows you to add users and login with social networks like Twitter, Facebook. Update the WordPress Login Screen to use a hi-res, full screen, resizing background image. Now completely responsive. I don’t suppose you happened to notice that every single comment on this post so far is Spam! Did I miss it? I didn’t see any reference to Janrain Social Login (formerly Janrain Engage) (https://wordpress.org/plugins/rpx/). This was, I believe, one of the very first plugins of this nature. I’ve used it since about 2009.